Draw more visitors to your retail business by effectively delivering promotional messaging with excellent visibility. OMD Series SMART Signage features2,500-nit high brightness and 5000:1 contrast ratio for superb visibility in various lighting environments. Even customers who are wearing polarized sunglasses can view messages with outstanding clarity and brightness, without the display-blindness effect typically experienced with LCD displays. Optimize brightness control while reducing display operating expenses and power consumption with an automatic brightness sensor. You can customize the maximum and minimum brightness within a range of 350-nit to 2,500-nit brightness to complement any environment and control expenses, while extending the life of the monitor. Present business messaging 24/7 even when the display is exposed to sunlightdirectly and indirectly for reliable around-the-clock operation.OMD Series SMART Signage is mechanically designed and has undergone internal testing to endure heat with a panel that can withstand up to 110°C (230°F) temperatures. LeverageSamsung’s industry-leading 2nd Generation SSSP and a powerful quad-core processor with SoC technology for outstanding performance.2nd Generation SSSP has advanced MagicInfo® Premium S all-in-one embedded content management solution that eliminates the need for a separate PC or media player. The result is an uncluttered and simplified digital signage configuration that delivers rich media content, enhanced operational efficiency and lower TCO. Manage content conveniently from a mobile device with built-in Wi-Fi and MagicInfo®solution, even when the displays are installed in difficult-to-access locations. MagicInfo enables professional management of multiple displays, and theMagicInfo Mobile application can be used on a tablet or other mobile device to easily deliver content to displays or to update the displays’ templates or content. Impress customers and reduce viewing distractions with a sophisticated design featuring a narrow 9.3 mm bezel and slim depththat offers an elegant appearance. 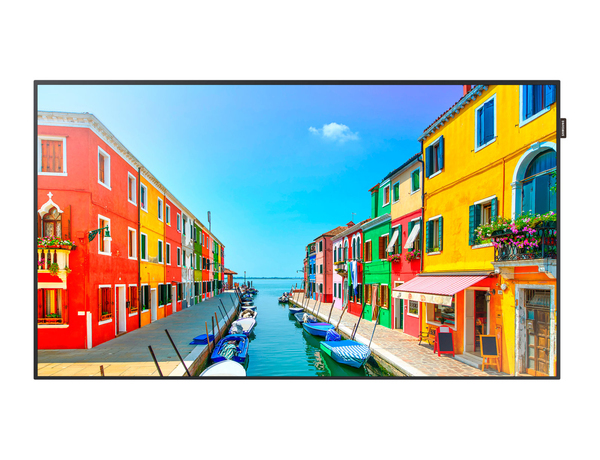 Slim bezels allow OMD Series displays to be used in seamless video walls for stunning window and wall displays. And with slim-depth panels these stylish displays deliver efficient use of space while reducing separate housing design costs. Take advantage of a variety of form factors to suit your display environment. As a standalone kit-type panel, the OMD-K is designed for specialized use in various customized housings to serve a wide range of configuration and environmental needs. OMD-W is an aesthetically pleasing standalone panel that is suitable for in-window store display usage with a backcover that hides its array of connectivity ports and openings.Both OMD-K and OMD-W models are available in various sizes (46”, 55” and 75”)for configuration flexibility.